Elasticsearch is an open-source, restful, distributed, search engine built on top of apache-lucene, Lucene is arguably the most advanced, high-performance, and fully featured search engine library in existence today—both open source and proprietary. Elasticsearch is also written in Java and uses Lucene internally for all of its indexing and searching, but it aims to make full-text search easy by hiding the complexities of Lucene behind a simple, coherent, RESTful API. 1.Near Realtime (NRT) Elasticsearch is a near real time search platform. What this means is there is a slight latency (normally one second) from the time you index a document until the time it becomes searchable. 2.Cluster A cluster is a collection of one or more nodes (servers) that together holds your entire data and provides federated indexing and search capabilities across all nodes. default cluster name will be "elasticsearch". 3.Node A node is a single server that is part of your cluster, stores your data, and participates in the cluster’s indexing and search capabilities. 4.Index An index is a collection of documents that have somewhat similar characteristics i.e like database. 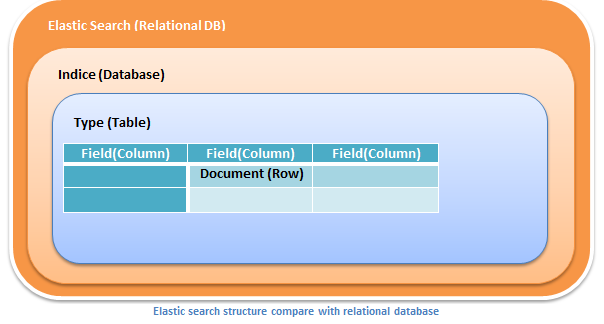 Below image will show how we can co-relate the relational database with elastic index which will make easy to understand the elastic terms and api. Client: using java client we can performe operations on elastic search cluster/node. Two types of client to get the client connection with cluster to perform the operations. Creat Index: We can create the IndexRequest or using XContentBuilder we can populate the request to store in the index.